The DMT Music and Dance Academy launched in February 2011 continues its Indian Music and Dance classes throughout the year. More than 100 students are enrolled in our classes held within the temple premises. 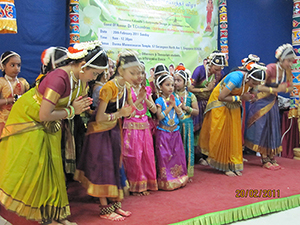 Students from our Sangeetham, Thevaram, Bharathanatiyam, Keyboard, Violin and Miruthangam classes participated in the Temple’s annual Navaraathiri celebrations. Practical assessments arealso done for Bharathantiyam, Sangeetham and Thevaaram and certificates awarded. Our fine arts students participated in several community functions both for greater exposure and as service to the community. The enthusiasm for the Dance and Music is good and the Temple intends to grow the talent of our devotees in the years ahead. Class schedules are listed below. Do contact the Temple administrators for more details.